On Monday April 8th, the Academy of Motion Picture Arts and Sciences (AMPAS) hosted An Evening with Distinguished USC Alumni, featuring a panel of Oscar-nominated filmmakers: producer Kevin Feige, Marvel President (Black Panther, Avengers: Infinity War); producer Stacey Sher, Co-President of Activision Blizzard Studios (Erin Brockovich, Django Unchained); and writer/director John Singleton (Boyz N The Hood). Producer Jennifer Todd, a fellow USC alumnus who is also a member of the Academy’s Board of Governors, moderated their discussion. It was a celebration of the School’s founding, ninety years ago, as a partnership between USC and the Academy. In 1929, the same year the Academy Awards debuted, Douglas Fairbanks Sr. – the organization’s founding President – organized a who’s who of Hollywood to teach a class called Introduction to Photoplay. Taught by such industry luminaries as director Ernst Lubistch, producer Irving Thalberg and actress Mary Pickford, among others. The class launched a cinema program that, after nine decades is now a distinct School with seven divisions and hundreds of classes. 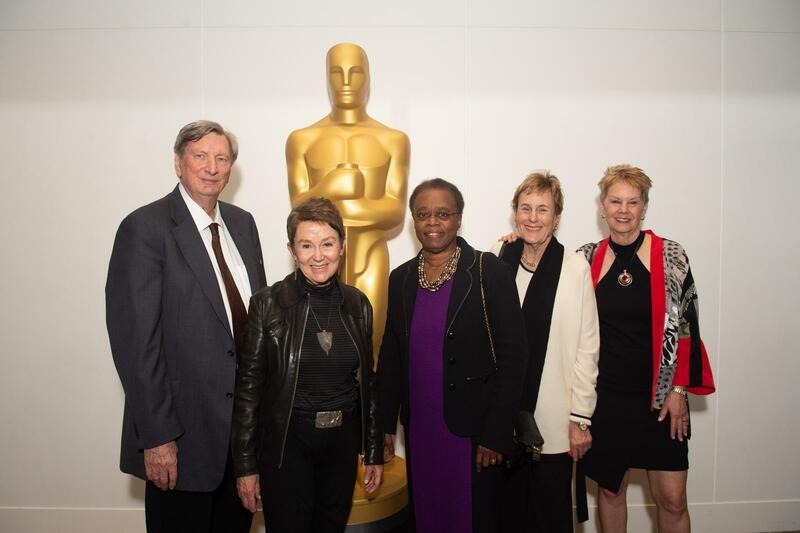 "I hope it is a bit like giving a birthday party for your child," said School of Cinematic Arts Dean Elizabeth Daley, as she thanked the AMPAS hosts. 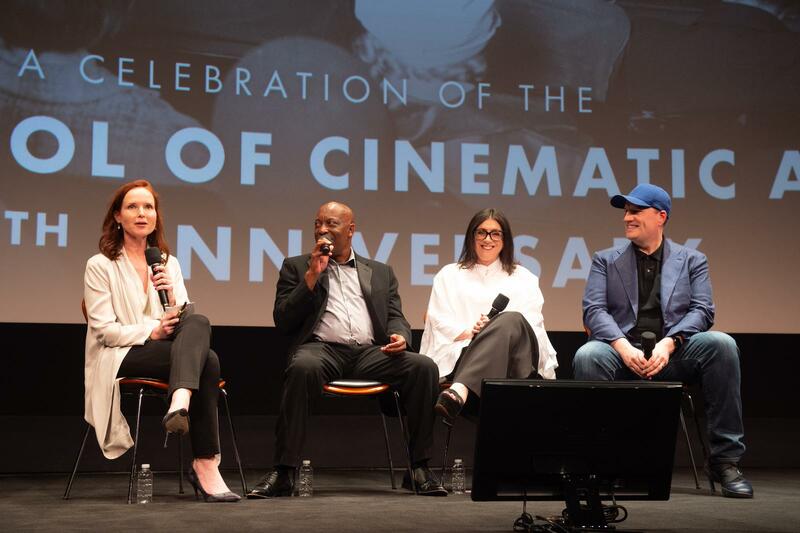 The lively panel discussion centered around clips chosen by Feige, Sher and Singleton. Each filmmaker showed two clips –– one from a film they loved and from one of their own celebrated projects. 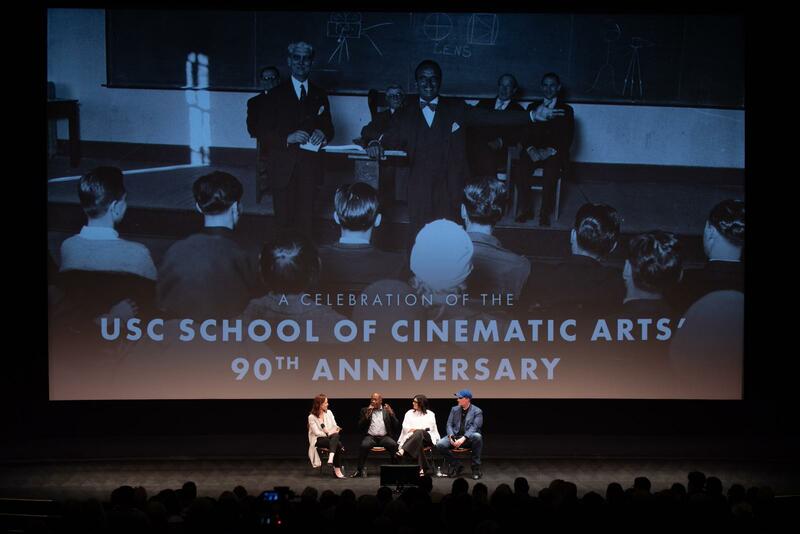 The format was a hit with the audience, made up of USC Cinema students, faculty, staff, alumni and supporters, including USC Interim President Dr. Wanda Austin, and university trustees Amy Ross, Suzanne Dworak-Peck, and Frank Price, who founded and has chaired the School of Cinematic Arts Board of Councilors for 28 years. “We’re going to be watching clips and talking about movies, something everybody in this room loves to do,” said moderator Todd. 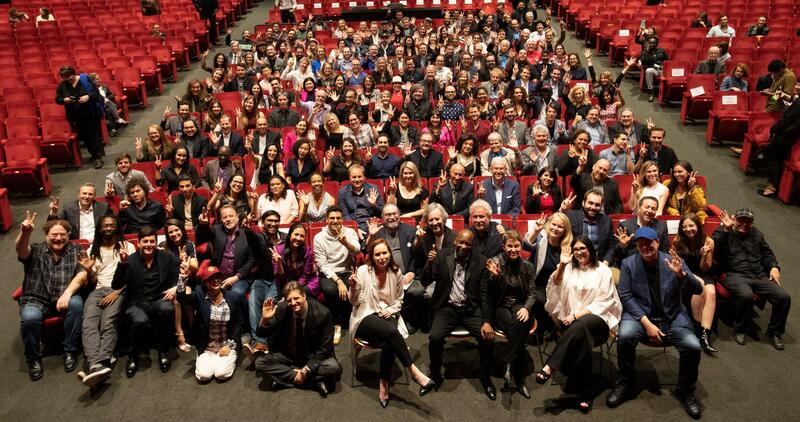 90th Aniversary at the Samuel Goldwyn Theater in Beverly Hills on Monday, April 8, 2019. Sher screened scenes from Hal Ashby’s Shampoo (1975) and Erin Brockovich (2000), the Academy Award-winning film she produced about the law clerk who became an environmental activist. Ashby films, she said, are like “pulling back the curtain on adulthood.” Sher, who graduated from the Stark program, remembered the program’s founder Art Murphy requiring his trainee producers to wear suits and skirts to class, a practice that elicited teasing from jeans-clad production students. “He gave us book, and made us watch The Bad and the Beautiful, in which Kirk Douglas plays a ruthless Hollywood producer who garners the hate of everyone he works with –– but at the film’s end, the screenwriter, director, lead actor, they are all waiting by the phone call for him to call,” she said. Feige showed Nicholas Meyer’s Star Trek II: The Wrath of Kahn (1982) and Iron Man (2008), the blockbuster he produced that launched the latest, globally-dominant iteration of the Marvel Universe. Feige chose the iconic scene from Khan in which Vulcan Spock chooses to go to the engine room of the Enterprise, sacrificing his life to save his shipmates, and marveled at the less-is-more special effects in the film, comparing it to the choices they made in Iron Man where budget constraints actually led to the creation of the one of the best scenes in the film. The panelists, including Todd, reminisced about classes, faculty and upgrades to the USC facilities. They talked about trips back to campus to talk to students, and the community atmosphere that has endured. Feige recounted seeing “Reality Ends Here” etched into the concrete of the first George Lucas Building and thinking “I don’t know how this could get any better.” Laughingly referring to the School’s state-of-the-art Cinematic Arts Complex, he added, “and then I saw how it could get better!” Sher said: “I ask [students] ‘Have you ever been on a studio lot?” It’s a lot worse than this!” Singleton, who has taught at the School, says he frequently calls to ask what films are screening in classes then goes to campus to watch with students and hold discussions afterwards.